KVS Lower Division Clerk Exam (LDC) Last Year Cutoff Marks 2014 & Approx Cutoff Mark 2015. 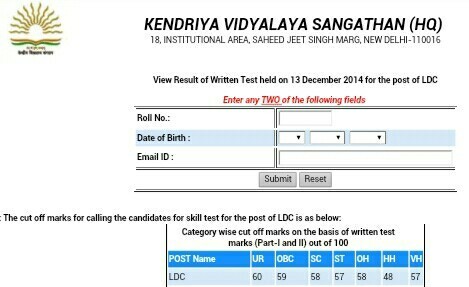 Kendriya Vidyalaya Sangathan (KVS) Has Successfully Conducted Lower Division Clerk Exam (LDC) On 11.10.2015. Huge No of Candidates Appeared this Exam. Now Candidates are Looking for its Last Year Cutoff and this Year Approx Cutoff Marks. Here We are Sharing Details About this year Question Paper Difficulty Level. 1. English- Moderate to Hard. See Here KVS LDC 2014 Cutoff Mark. Now Candidates Can Download KVS LDC 2015 (11.10.2015) Exam Question Here. Download Here KVS LDC (11.10.2015) Exam Question Paper. Soon KVS will Upload its official Answer Key Candidates Can check it through Official Website. Download Here KVS LDC (11.10.2015) Exam Question Sheet/Answer Key.